Posted on Wed, Feb 15, 2012 : 10:38 a.m.
Ann Arbor-based venture capital firm Arboretum Ventures hopes to rely less on investment partners after raising $140 million for new startup investments, according to the Wall Street Journal. 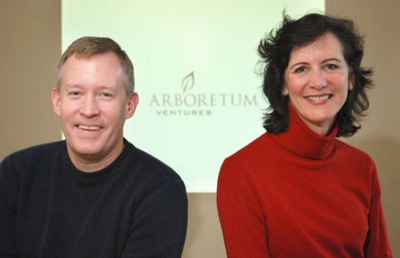 Tim Petersen and Jan Garfinkle are managing directors of Arboretum Ventures. Arboretum, one of the most influential venture capital firms in the Midwest, plans to rely less on "syndicates," a VC term used to describe an investment deal in which multiple firms invest simultaneously. Such deals are typically used to lessen the risk among investors and increase the chances that a startup will always have access to the cash it needs to grow. In recent years, Michigan venture capital firms have relied on syndicate deals to attract outside investors to local deals. Many times California investors, for example, are more willing to back a Michigan company if a Michigan VC firm joins the deal — so that the California firm doesn't need to have a local presence to monitor the progress of its investment. But the Wall Street Journal reported Tuesday night that many medical technology investors are reconsidering that strategy. "The difficulty health-care investors have had in selling companies or taking them public recently has forced them to hold positions longer," the Journal reported. "As years go by, investor groups that started strong can fray."